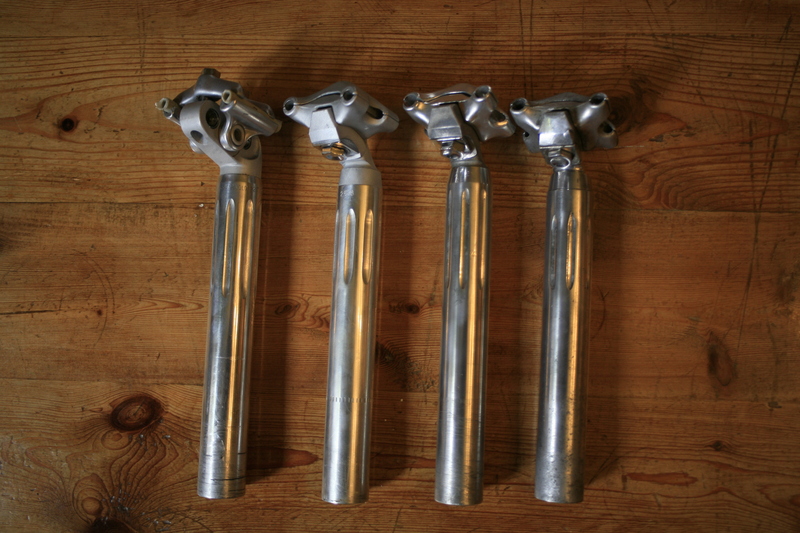 Most vintage bike enthousiasts know that there are 2 types of super record seat posts, the 2 bolt design and the single bolt design also known as the second gen. Surprise, the second gen has 3 variations, very small differences just like the c record first and second gen seatposts and headsets. 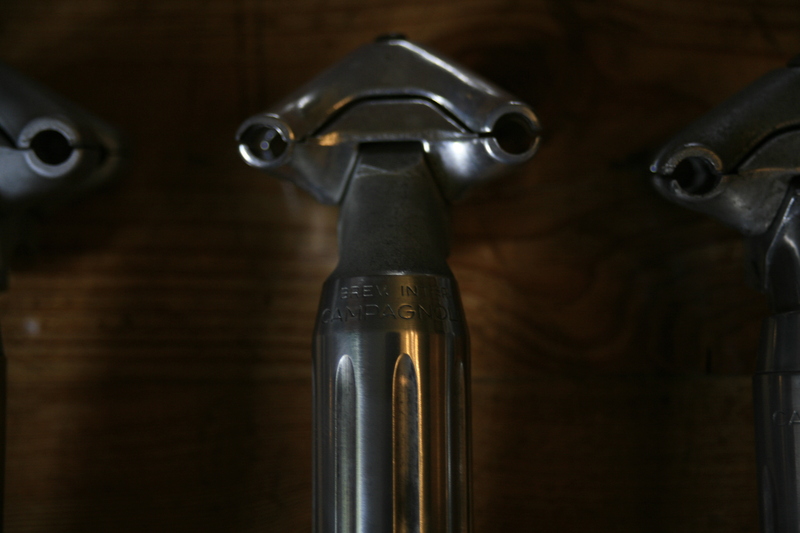 1: 1973-1978 based on the superleggero (or nuovo record superlight) seatpost with alloy shoulders for the saddlerails and the well known indistructible steel clamps, machined bushings and the typical campy bolts, notice the elegant letters of the campagnolo logo that go around the seatpost, not like the nuovo record with the worldlogo on the front. 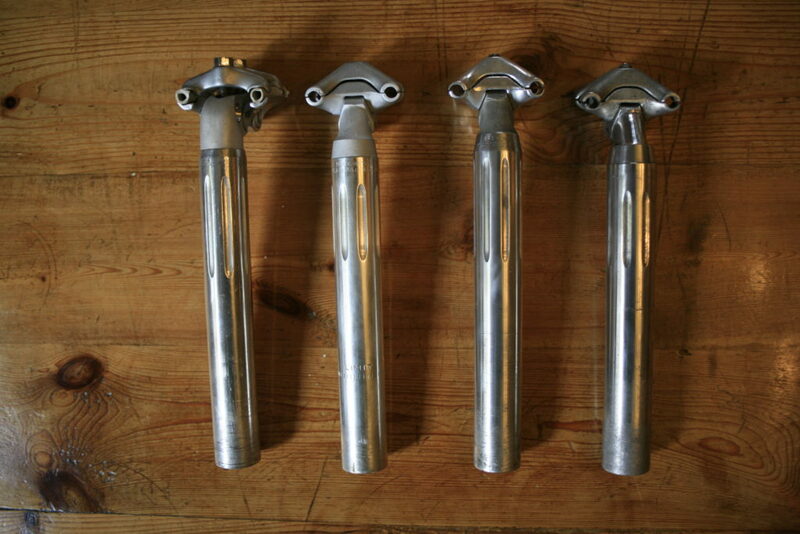 The flutes are also really subtile not like those homemade seatposts you see done by people themselves. 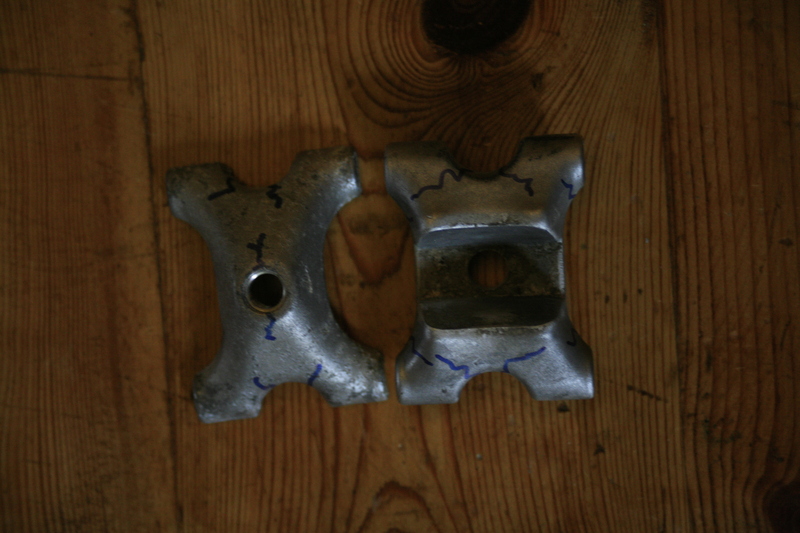 The upperpart is casted alloy, the lower pard is machined and polished (the one in the picture has been restored). 2: 1983-1984 “brev inter. 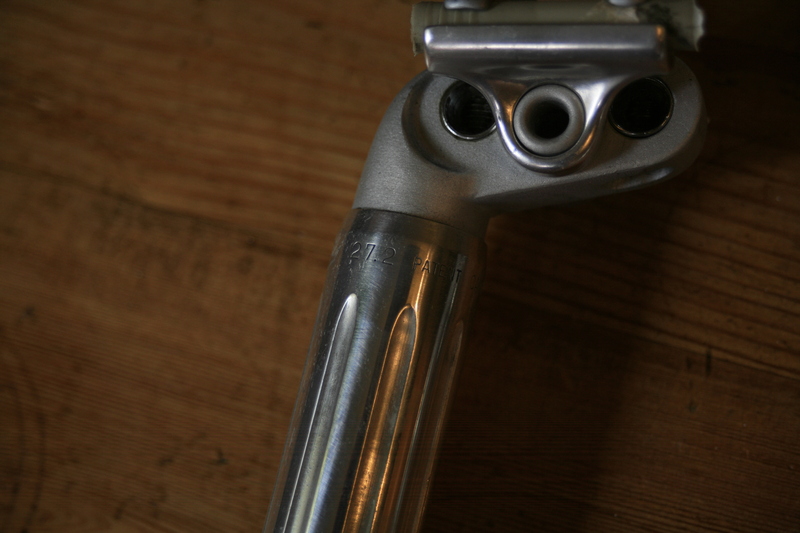 campagnolo” stamped on the shaft, matte saddleclamp. 3: 1978-1982 “brev inter. 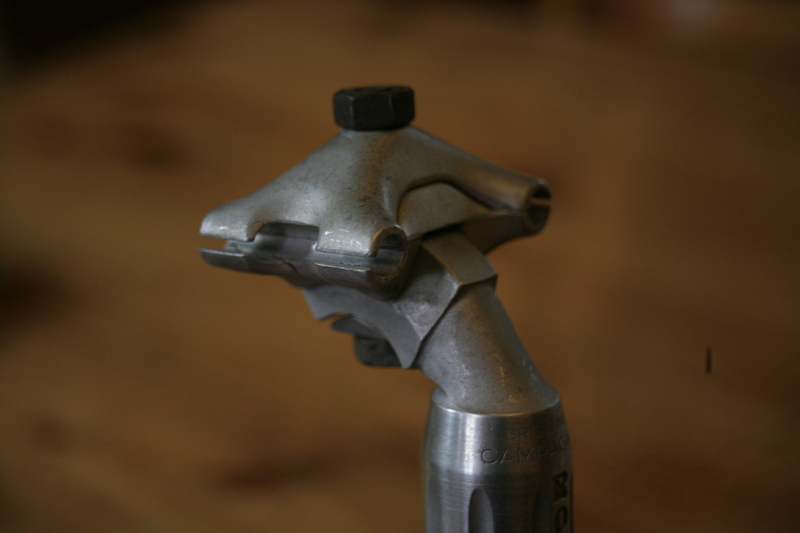 campagnolo” stamped on the tapered piece of the seatpost, the clamp is polished and anodised. 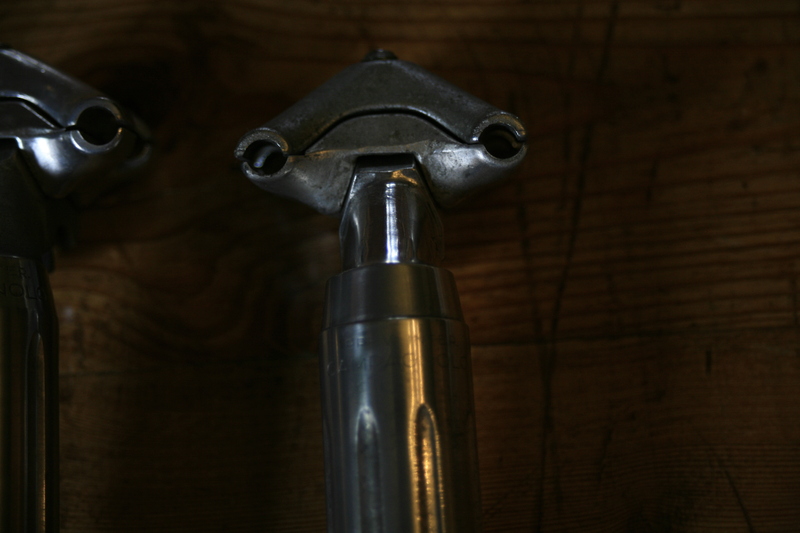 4: 1985-1987 fully polished seat post, matte saddleclamp. 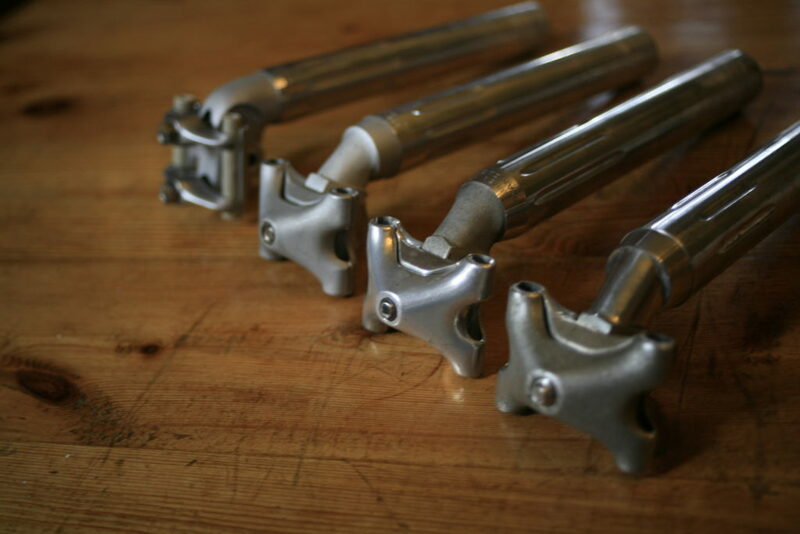 The material Campagnolo used for these seat posts was a cast-alloy. 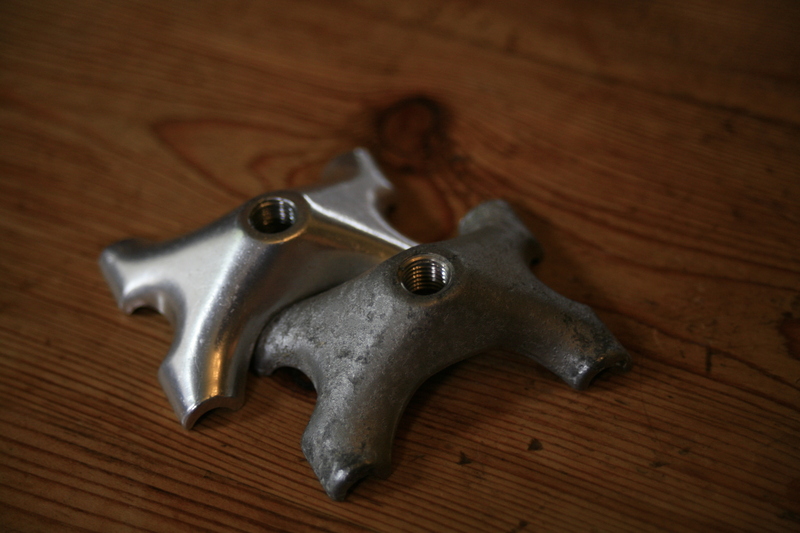 Very good for machining but not very corrosion resistant. So we often see seat posts that are stuck, especially if the flutes were deep enough in the frame, when riding in the rain the water gets in the frame trough the flutes and everything starts oxidizing. 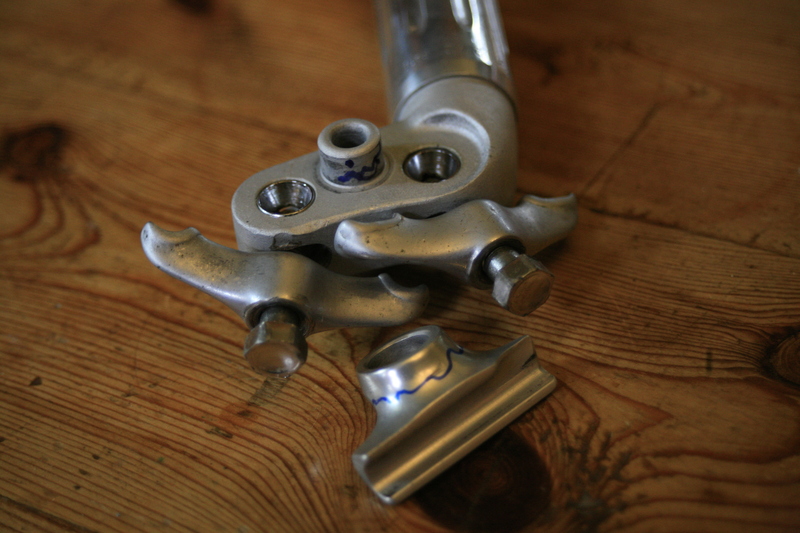 just like the superleggero seat post the small shaft on the clamp intend to break if your weight is too high (I would not recommend riding this seat post if you are +85kg) (see the pictures for most common crack areas). This is a SUPER article. Thank you so much! 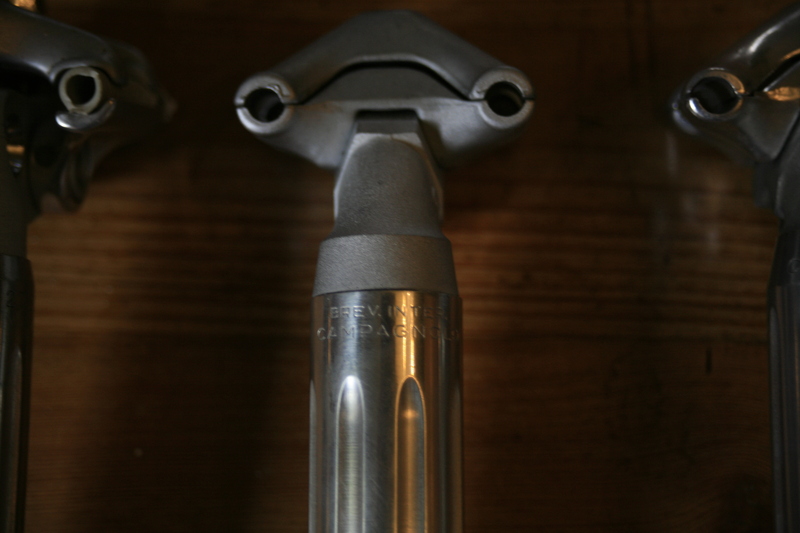 It is difficult to keep straight on all the small changes in the multiple versions of these vintage issues (God bless Campagnolo!) One suggestion for when you re-do the article (since you mention you found additional versions of the seatpost and will update): my eyes are not that young – could you please consider lighting the photographs more brightly? Some are too dim for me to really see all the detail you describe. Thanks again for one of the best articles I’ve read in a long time. Thanks! and yes those were the early days where I took photographs on the coffee table in the living room… I have some cheap studio lights now that do the trick a bit better (as you might see in newer posts) but I’ll keep it in mind for the update! 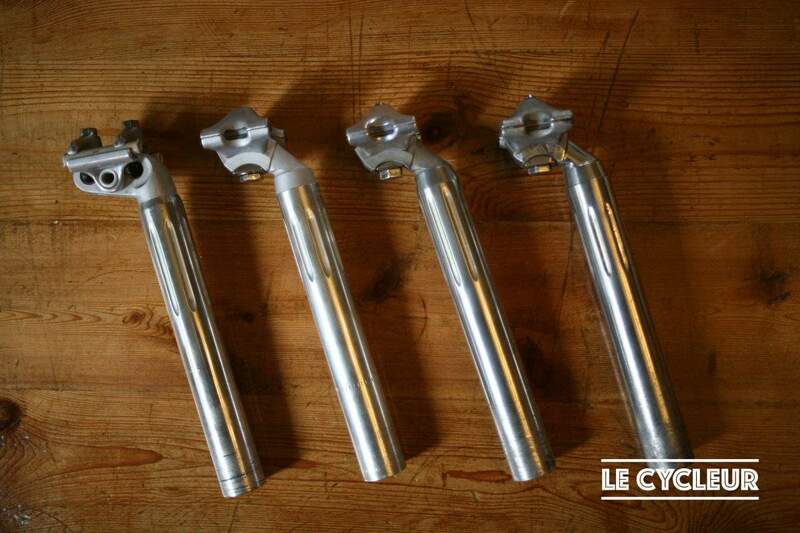 I think that the seatposts are in the correct chronological order in the picture but not in the text: I’m I wrong? 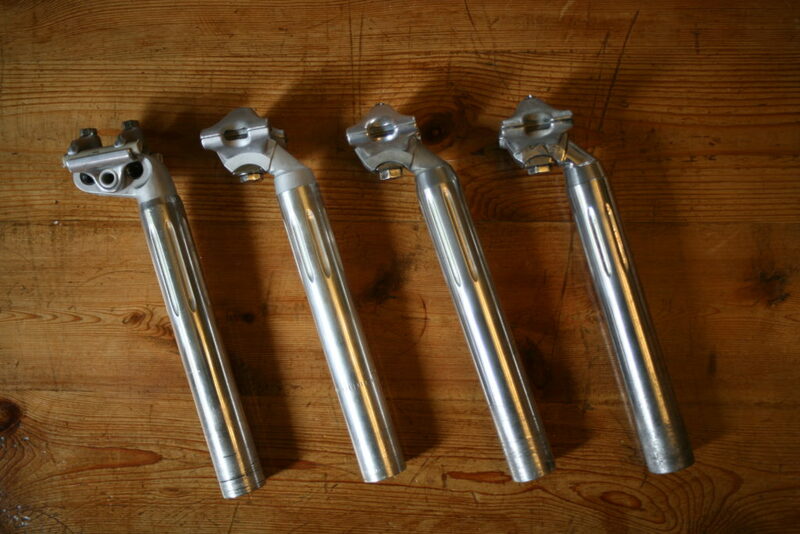 I enjoy the web site for researching my vintage rebuilds. I raced in the early 70’s. I am unable to find contact details. Is there a reason? Aha, good point! At the bottom you can find all my info and social network sites and stuff in the black box, next to written by: but thanks for pointing out, we will make a new “contact” button on the website to make it a bit easier in use.